We get many requests for aphid identification, especially in May and June when aphids are on young growth. Requests are fewer in October, but this year brought a request plus photos from Nigel Gilligan in Cumbria for identification of a striking red aphid. It turned out to be Uroleucon tanaceti feeding on tansy. Nigel was impressed by their bright appearance and odd distribution, 'widely scattered looking almost like sentries'. We thought this was warning coloration, but a literature search revealed these aphids are usually hidden on leaf undersides - not at all 'right' for an aposematic display. 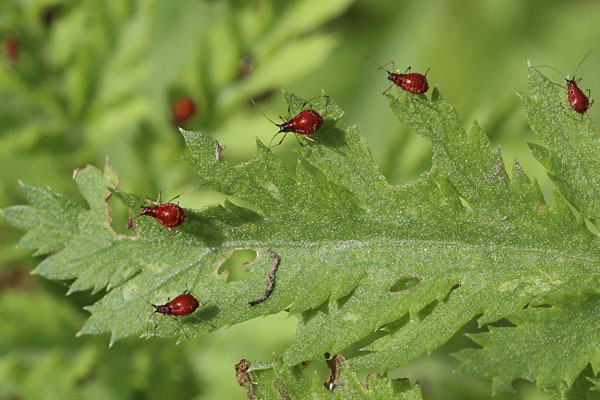 So Nigel embarked on a mini-study of crimson tansy aphid behaviour - and we decided aphid colour would be the topic of our October and November blogs. The colour of aphids results from pigmentation of the haemolymph (termed ground colour), melanism of the cuticle and waxy exudates. The ground colour is mostly produced by two distinct groups of pigments, aphins (technically known as polycyclic quinones) and carotenoids (yes, carotenoid compounds are what make carrots orange). These two pigment types are able to produce a great range of colours in aphids, from the familiar blacks and greens of 'blackfly' and 'greenfly' to reds, yellows, gold and turquoise in less well known aphids. The aphins were initially identified and characterised by Lord Todd and his co-workers (Duewell et al., 1948). 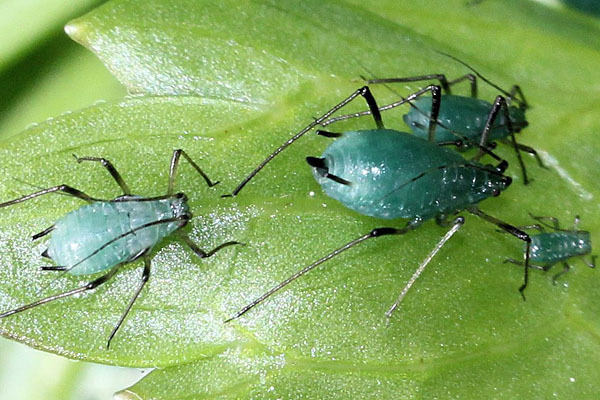 These included protoaphin, which is responsible for the dark colours present in for example Aphis sambuci (pictured below first) and aphinin, which occurs in the green morph of Macrosiphum rosae (pictured below second). One should perhaps emphasise at this point that green aphids don't acquire their green colour from chlorophyll. There is no chlorophyll present in the phloem upon which aphids feed. Aphins also produce some of the more dramatic aphid colours. For example the yellow pigment (neriaphin) found in Aphis nerii (see zen through a lens) is a quinone pigment, as is the red pigment of Uroleucon nigrotubeculatum, named uroleuconaphin (Horikawa et al., 2006 ). 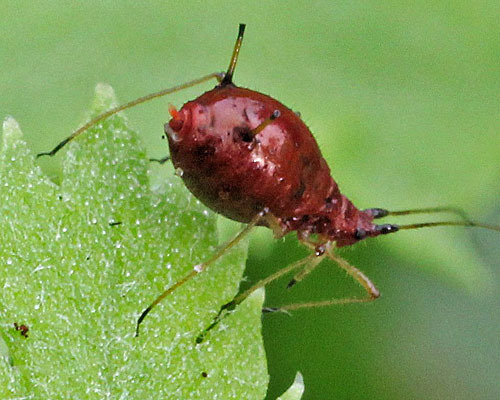 Although it has yet to be characterised, we suspect that the red pigment in the aphid that Nigel found (Uroleucon tanaceti, see picture below) is uroleuconaphin, or closely related to it. Many aphids also have red carotenoid pigments. Carotenoids are coloured compounds mostly produced by plants, fungi, and microorganisms which are required in the diet of most animals for oxidation control or light detection. The colour of the red form of Macrosiphum rosae is most likely produced by a carotenoid pigment (see picture below). Until recently it was assumed that all the carotenoid pigments in aphids were either obtained from plants or from intracellular symbionts. But then Moran & Jarvik (2010) unexpectedly found that the pea aphid (Acyrthosiphon pisum) genome itself encodes multiple enzymes for carotenoid biosynthesis. Phylogenetic analyses showed that these aphid genes are derived from fungal genes, which have been integrated into the aphid genome and duplicated. (see also Not exactly rocket science). Some aphids may use other quite different pigments synthesised by their host plant. The aconite aphid (Delphiniobium junackianum) is a vivid turquoise (see picture below). It feeds on monkshood (Aconitum napellus), a highly toxic garden plant which was popularised for the painful disposal of unwanted relatives in the much-watched, if brainless, British television programme "Midsomer Murders". The pigments of Delphiniobium junackianum have yet to be examined by researchers. 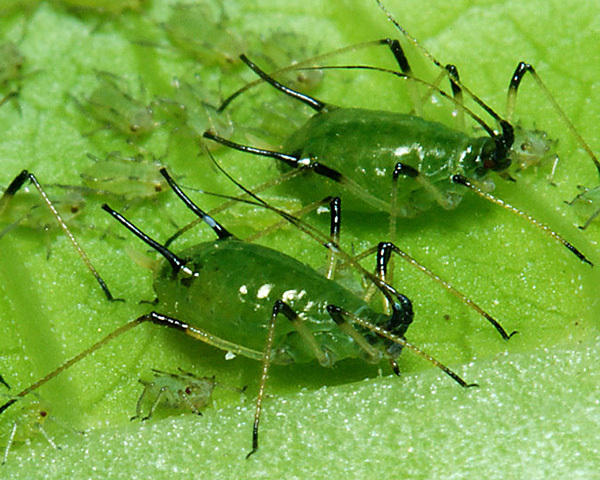 They may be an as-yet uncharacterised aphinin, or these aphids may acquire their colour directly from their food plant. Conventional wisdom dictates that structural colours are not present in aphids (van Emden & Harrington, 2007). Nevertheless several Cinara species such as Cinara pini (shown below) display a bronzy iridescence which is most likely derived from structural components of their cuticle. Structural colours include the especially prominent iridescent patterns on the wings of some aphid species. These patterns have been dismissed as 'random' iridescence, as in a soap bubble, which are unstable - in other words, they vary depending upon the angle of view, and no serious study seems to have been done. But in hymenopteran wings, Shevtsova et al. (2012) has shown there are stable coloured patterns, caused by thin film interference, which remain visible from any angle. They merely need to be examined against a dark background! So what is the adaptive significance of colour in aphids? colour in insects is most frequently involved as a defense against vertebrate predators. Coloration can be aposematic, deimatic or cryptic. Colour also has important consequences for body temperature, and in some insects is important in mate recognition. How does aposematic coloration work? The function of aposematic coloration is to make the aphid highly conspicuous to potential predators so that it is noticed, remembered and then avoided - assuming, that is, the predator finds the experience sufficiently unpleasant. In terms of a life history strategy, aposematism is at the opposite end of the spectrum to crypsis - cryptic aphids try to make themselves very inconspicuous to predators. Given that these initial encounters tend to kill the 'teachers', which cannot therefore reproduce, the mechanism by which aposematism evolves may not be immediately obvious. However, the parthenogenetic nature of aphids means that members of an aphid colony are all very closely related. Hence aposematism will be adopted through kin selection - in other words the teacher attempts to ensure the survival of its own genes by benefiting closely related individuals. Assuming an aphid wants to be seen by predators, what characteristics are important? According to Prudic et al., 2007 two important factors are high chromatic (colour) contrast, and high luminance (brightness) contrast. Among insect predators, insect larvae (such as coccinellid and syrphid larvae) have simple eyes and therefore cannot see colour. Hence high luminance contrast, as well as behavioural characteristics, will be the main factor. Wax stripes, as seen below in a colony of the elder aphid Aphis sambuci are a good example of high luminance contrast. 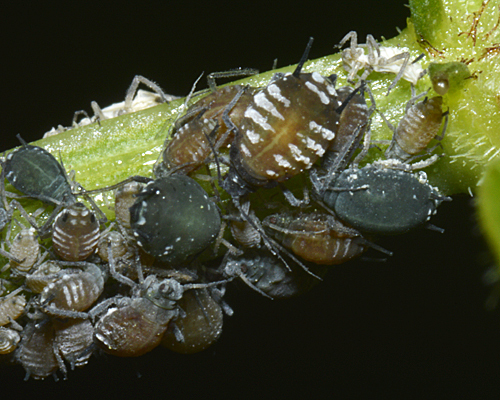 Elder aphids contain toxic compounds, such as cyanoglycoside sambunigrin, which produce hydrocyanate when consumed by a predator. Hence, to any predatory insect larvae which survives the experience, the wax stripes should provide effective warning. Adult insects have compound eyes and therefore can see colour, although the majority are only bichromatic - they have just 2 types of colour pigment receptors, so their colour spectrum is limited. In addition, the spectrum of colours visible to insects is somewhat higher than for humans because, although most insects cannot see red, they can see in the ultraviolet part of the spectrum. Daylight hunting spiders also appear to have colour vision, as do vertebrate predators such as birds and lizards. 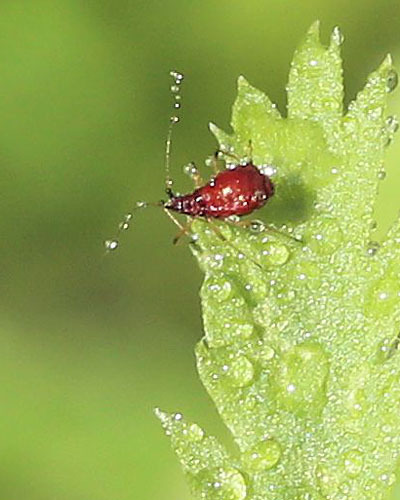 The crimson tansy aphid (Uroleucon tanaceti) is an excellent example of an aposematically-coloured aphid. It would appear crimson to insectivorous birds, but black to insect predators and grazing cattle. We have never found this aphid ourselves, but Nigel Gilligan (one of our regular contributors from the north of England) sent us some really nice photos of it earlier this year. Uroleucon tanaceti feeds on tansy (Tanacetum spp.) which contains a volatile oil containing thujone, camphor and myrtenol. It seems likely that the crimson tansy aphid acquires its unpalatable nature (Mehrparvar et al., 2013) by concentrating some or all of these compounds. 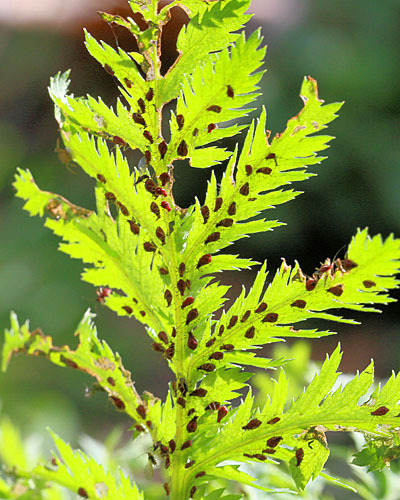 - If so, adult aphids may be much more distasteful than young ones. When Nigel first spotted these aphids, they were spaced out in a near regular pattern of dispersion on the upper surface of the leaves (see picture above). All of these were adults. Further examination revealed that most of the colony (including all the young) were on the undersides of the leaves (see first picture below). This may explain the apparent 'mystery' noted by Heie (2009) of an aposematic prey living concealed from sight. It seems reasonable that adults on the leaf topsides are especially distasteful 'sacrificial lambs' which predators might take (and then regret), thus ensuring that the great majority of the colony remained untouched. If the adults on top of the leaf are post reproductive this would be an added benefit given those in the colony are so closely related. So why has this not been observed before? On a repeat visit to the colony following some wet weather Nigel found that all the aphids were on the undersides of the leaves. Since rain is recognised as an important cause of aphid mortality it is reasonable for them to use the leaf undersides as shelter during rain. So we suggested a simple experiment: spraying the aphids with water. Sure enough, a light sprinkle of water produced a rush for cover (see second picture above). It seems their display is weather dependent. One group being sedentary, clumped, aposematically coloured, toxic and/or ant attended aphids. The second group being mobile, more randomly dispersed, and cryptic aphids. Dixon's reasoning clearly does not work for Uroleucon tanaceti since it is a highly mobile aphid, but toxic and aposematic. 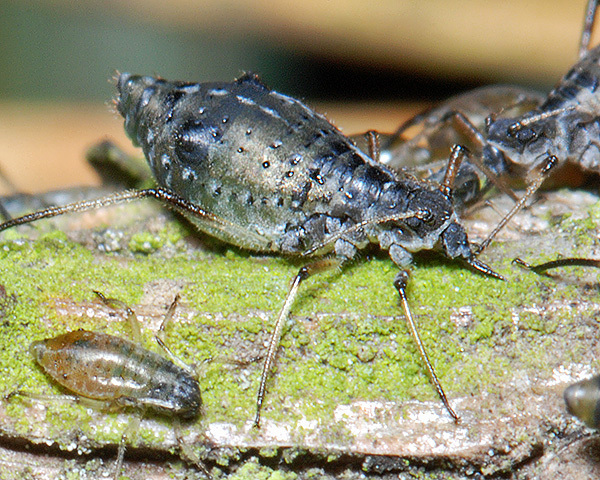 Moreover, as we see in part 2 of this blog, the developing nymphs of aphids such as Cinara confinis are cryptically coloured, but feed in large sedentary groups. Deimatic behaviour is closely related to aposematic behaviour, and means any pattern of threatening or startling behaviour - such as the sudden display of eyespots by moths. 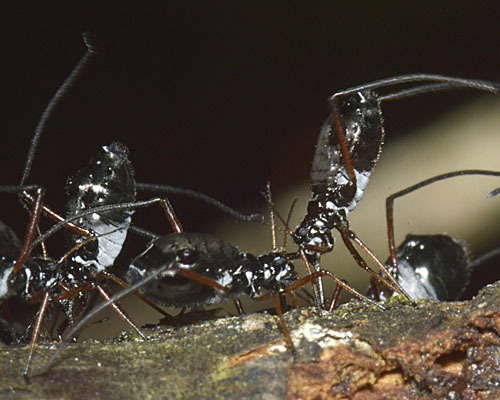 We haven't encountered an example of deimatic coloration in aphids, but the 'leg kicking' response of several Lachnus and Cinara species is an example of deimatic behaviour. 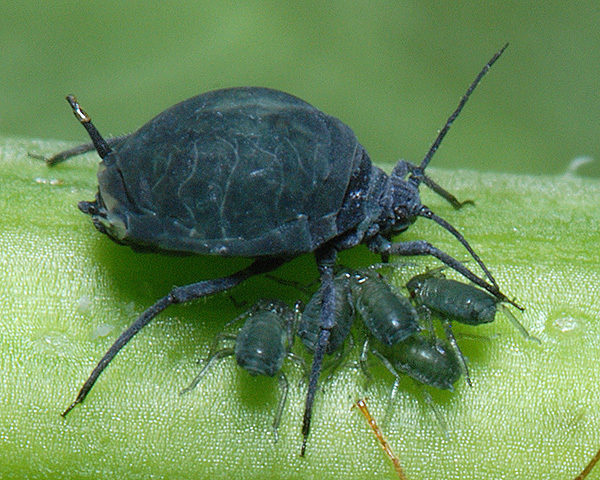 The picture below shows this behaviour by the invasive aphid Cinara curvipes. Disturbance appears to provoke the behaviour, but the posture may be held long after the source of the disturbance has passed. Some authors have suggested this posture is used to elicit feeding (honeydew removal) by ants - which, in turn, avoids sooty mould growing on honeydew around their colony. Our especial thanks to Nigel Gilligan for his photographs and experimental work on Uroleucon tanaceti. Dixon, A.F.G. (1997). Adaptations of phytophagous insects to life on trees, with particular reference to aphids. pp 3-14 in Watt, A.D. et al. (Ed) Forests and Insects. 18th Symposium of the Royal Entomological Society. Chapman & Hall, London. Duewell, H. et al. (1948). Colouring matters of the Aphididae. Nature 162, 759-761.
van Emden, H. & Harrington, R. (2007). 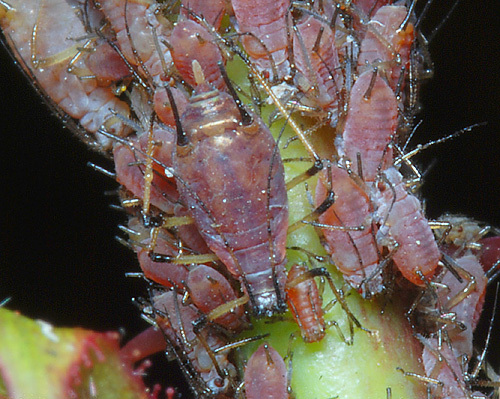 Aphids as crop pests. Cabi Publishing.